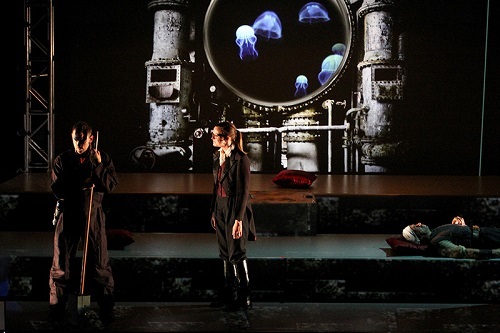 Produced as part of PANAMANIA, the arts & culture component of the Pan Am/Parapan Games, Twenty Thousand Leagues Under The Sea adapts the Jules Verne classic into a meta-theatrical multi-media event with a gesture towards environmental messaging. It’s an ambitious undertaking with such stunning aesthetics that its failings seem more prominent than they otherwise might. Jules (Andrew Shaver) – not Jules Verne, but a character named after the famous science fiction writer – is the narrator, setting up the story by manipulating plastic action figures against the backdrop of a laptop screen. The laptop plays various locales, and a small camera projects a live-stream of the action figures and their background onto the stage. This means the audience enjoys a big experience of the small figures Shaver plays with, while also able to watch his charming delivery. The play seems to begin in the modern era, which worked for Jules’ story-telling character. But it was confusing for my companion and I that he introduced Dr Aronnax (Mary-Lee Picknell) as a scientist giving a TED talk on the Great Pacific Plastic Patch but then when the action starts she is back in 1870, like Verne’s Arronax (albeit gender-swapped) with only that era’s knowledge, scientific or otherwise. The Nautilus and the underwater world are magically created by some of the most adept and innovative stagecraft I have ever seen. Projections, scrims, fly systems, puppets, and a unique layout of risers combine with lighting and sound to make Twenty Thousand Leagues Under The Sea a sumptuous experience for the senses. Which is why I was surprised when we came to the most famous scene from the novel, a battle with a giant squid, to find that the climax was a harpoon bouncing harmlessly off a cardboard cutout of a squid eye, played as if we were to accept it as a successful shot. Similarly it was disconcerting throughout that, with so much attention paid to other visual concerns, no one had ensured that Captain Nemo’s costume fit him. The whole story could use tightening up and polishing. The potential is there for this to be a truly great show if some time was spent on the script. Even in its current state, it’s worth a watch for the spectacle and technical wizardry.